No contemporary record of a house number for Bradford House exists but, thanks largely to research by Revd Lesley Crawley, it is now beyond doubt that it is the building, now converted as apartments, numbered 47. The house was originally constructed in 1900, possibly as part of the Coast Development Company project which included the Grand Hotel (whose kitchen garden was directly opposite) and the pier. It was expanded and adapted as a shop in 1910. Joseph William Button - Credit Draper (K1916). Note: Joseph, who was born in Hackney in London, is not directly related to the other Buttons in Southwold, although it is believed that his ancestors were Suffolk people. Joseph's father, Ebenezer, had worked for a Bradford wool firm before setting up his own drapery business, Button Brothers, in Luton. When his son Joseph decided to go into business on his own account, it was with the financial backing of his father's firm. Joseph's first shop was an outfitter's in Kessingland, just up the coast from Southwold, which was close to his wife's home town, Lowestoft. 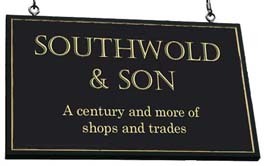 In 1910 Joseph decided to move the business to Southwold. He had now been married to Happy Victoria (nee Jacobs) for 15 years and they had five children. 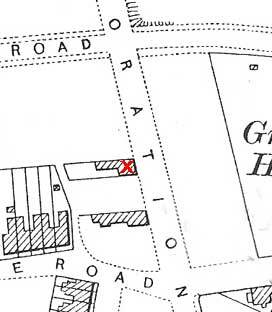 The house they found in Corporation Road (now Marlborough Road) was renamed 'Bradford House' in recognition of Joseph's father's origins and a purpose-built shop was created in the front. Happy Victoria's family were Lowestoft builders and doubtless had a lot tto do with the conversion. 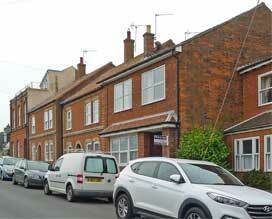 While this was taking place, the Button family rented No 3 Station Road as a temporary base. It is not known exactly when the family moved in and opened for business but it was probably about 1912. The family lived above and behind the double-fronted shop which, in addition to drapery, sold ready-to-wear and bespoke tailoring. To the rear of the premises were stables where the Buttons kept a horse and cart for deliveries. The shop traded here throughout the war although the family moved inland temporarily while the living quarters were occupied by soldiers..
Joseph Button dies in Southwold Cottage Hospital unexpectedly after an appendectomy, on March 20th at the age of 43. He leaves his widow, Happy Victoria, the sum of £2,653 (about £56,000 in today's money). Joseph's death not only represents a considerable trauma for the young family but also necessitates the closing of the business as the directors of Button Bros of Luton decide not to continue financing the Southwold shop under the management of Joseph's son, Reginald. Joseph's daughter, Mildred, told the story of her early life in Southwold in a collection of diary entries and memoirs which have been edited by her son,Arnold Pacey to whom we are indebted for most of the above history. To read an extract, click here. No 47 in the foreground. 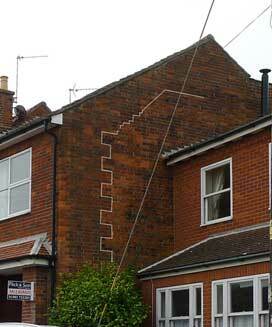 The exposed gable wall shows evidence of later expansion forwards and upwards - perhaps by the Buttons in 1910. See approximate mortar line highlighted below. Pier View (No 43) is the house on the far left of the top picture. Detail reproduced from a photo in Barrett Jenkins' Reminiscences of Southwold through Two World Wars' by kind permission of the author's daughter, Ann Thornton.